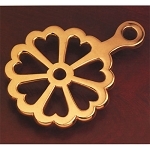 Beautiful trivets from Brass & Silver Traditions enhance any table setting and they work equally well as wall decor. Our cake knife sets are, simply put, classically elegant. We are sure you will fall in love with these quality cake knives and trivets.